As stewards of an estate with more than three-quarters of its acreage dedicated to natural habitat, sustainability is the foundation of our green business practices. We take into account the impact every viticultural and winemaking decision has on the native ecosystems under our care. 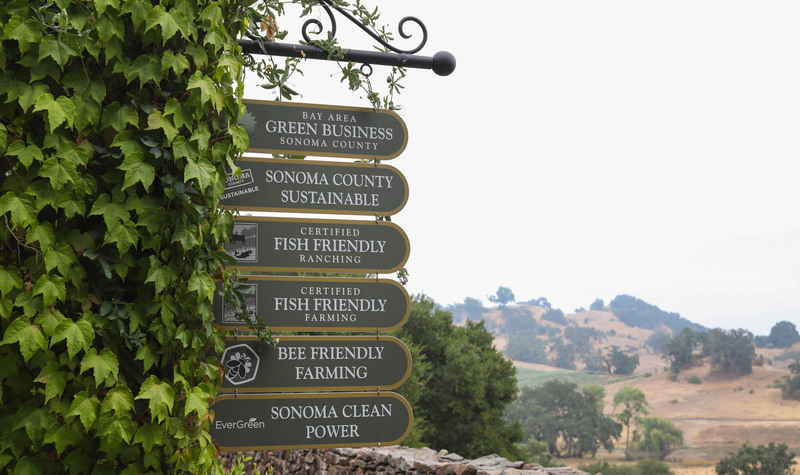 As one of the leading California sustainable wineries, Jordan has been a member of the Sonoma Green Business Program since the 1990s, and we continue to utilize the latest technology to effectively reduce, reuse and recycle. The Winery Chateau is fitted with energy-efficient "cool roofs," refrigeration units, warehouse doors, pre-insulated COOL-FIT® piping systems, USES® Power Shaver technology and LED lighting. Extensive waste water reclamation systems have been built to reuse our processed water for landscape and vineyard irrigation. Recycling of various products, such as lees, cardboard, glass, plastic and aluminum, is a standard procedure. Efficient generators capture nitrogen from ambient air to reuse as an inert gas during wine bottling. These collective measures helped us decrease Jordan's carbon footprint by 24 percent from 2007 to 2011—the equivalent to planting 74 acres of pine or fir trees. Once our energy use reached the lowest possible level, American-made solar arrays were installed in 2012 to power the winery. By 2014, Jordan's electrical use was fully carbon neutral. Roughly 90% of our electricity comes from solar energy and the balance from renewable resources through the Sonoma Clean Power program. Each year, the energy generated from our hillside solar panels is equivalent to saving nearly 62,000 gallons of gasoline or planting nearly 14,000 trees. Our ranch manager works year-round to preserve the sustainability of Jordan Estate's nearly 1,200 acres. A diverse array of cover crops are planted, each matched to a specific soil type to improve soil health and promote insectary growth. We make our own compost from pomace and other winemaking by-products, as well as landscape debris, manure and food scraps. We also return vine and tree prunings to the ground as natural compost. Organic fungicides are utilized to combat ailments when necessary. Two lakes provide habitat for beneficial insects and myriad bird species, including raptors that prey on harmful vineyard pests. Multiple electronic devices monitor vineyard blocks and track weather from iPhones, iPads and computers, maximizing the efficiency of irrigation while minimizing the number of times vehicles must enter in the ecosystem. ATVs are favored as transportation, and irrigation is done precisely and judiciously. We understand that what is best for the Earth is ultimately best for our wines. With sustainable practices at the heart of our business, we hope to carry on this expression of responsibility to the environment so that the enjoyment of our wines continues for generations to come.